From going under, to across, to seeing it from afar, we’ve rounded up five places (and ways) to get the best view of the Golden Gate Bridge. The family is riding around in their oh so cool convertible, smiling and looking very happy, as they’re driving across the bridge. And then it cuts to a young John Stamos playing the guitar with his perfect hair. Sigh. How about you just watch the epicness of it all in the video clip below. Hey, it was epic in the 90s! And then I’ve seen the Golden Gate Bridge in movies, mostly being attacked by a creature or taken over by apes or destroyed by a solar flare, earthquake and other natural disasters. My first up-close view of the bridge was during a spring break trip we took there as a family. We spent a few days in Yosemite. (Spring is a fantastic season to spend in Yosemite National Park.) And a then a few days in San Francisco at an Airbnb. 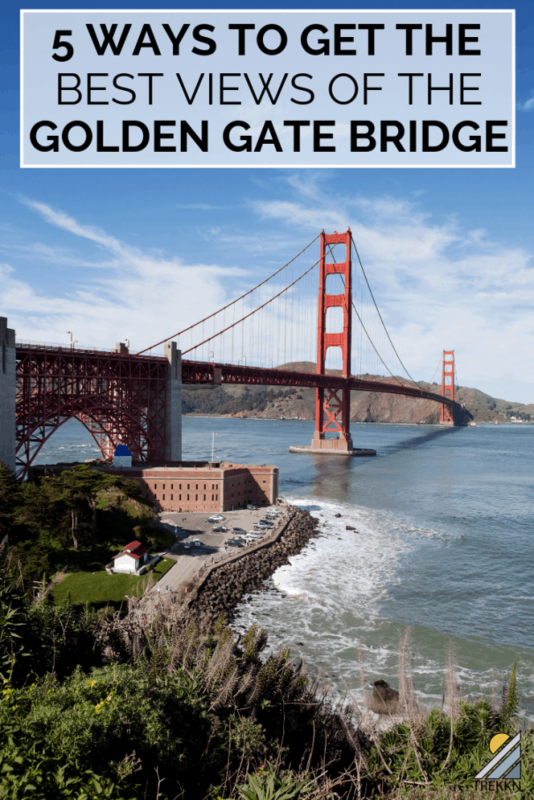 One of our kids had done some research (like you are right now) on the best places to get a spectacular view and photo of the Golden Gate Bridge. Baker Beach kept coming up in his search and we were so excited to head there asap. We found parking fairly easy, got out and walked down to Baker beach armed with our phones, cameras, and excitement. It really is a spectacular view and on any day, no matter the weather, can take your breath away. As we started walking on the beach closer and closer to the bridge for the perfect spot for that perfect shot, we noticed something. We noticed men playing frisbee. Completely naked. Little did we know that the northern section of the beach is clothing optional. Oops. So just know that the end nearest to the bridge is clothing optional. We did get some amazing photos, even though I had to crop out a few, well, you know. Here’s a slightly grainy meh picture I took with my phone and a much better one from our son’s Instagram. I do highly recommend Baker beach for a photo opportunity of this beauty. I hear it’s spectacular at sunset. In all honesty, we’re not big bus tour people. Part of it is we like to be in control of our travels and part of it is because they’re so touristy and often-times crowded, but we decided to try out the hop on hop off tour with Big Bus Tours for part of the day. We liked the idea of being able to get off any time we wanted and explore an area on our terms. We decided it would be fun to ride on the top of the bus so we could get the best experience of driving across the Golden Gate Bridge as possible. Let me tell you, it.was.windy. We had the Classic One Day Ticket, which allowed us to see just enough of the sites of San Francisco. There are several ticket options including premium, deluxe and a night tour. Check them all out and choose the best one for you here. Would we do it again? Probably not. But it was a fun one-time experience and a cool way to see the Golden Gate Bridge from a different perspective. 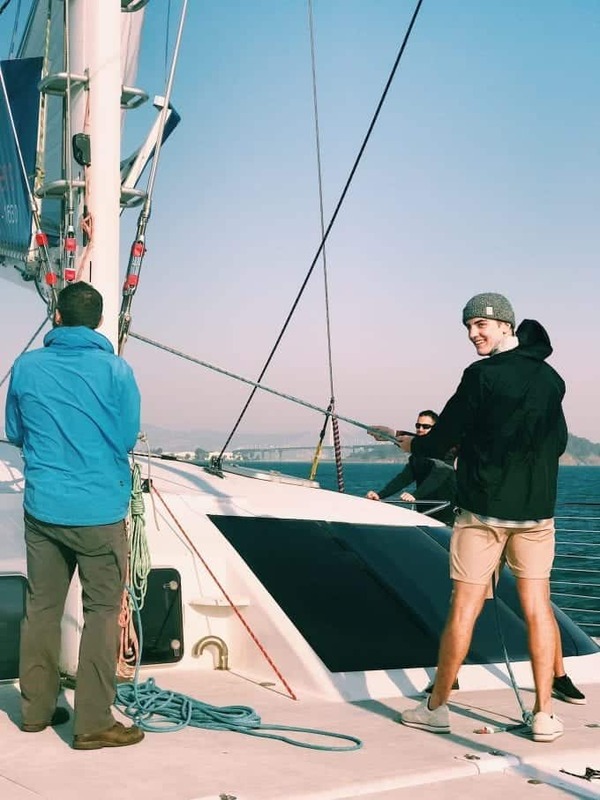 Sailing up to and under the Golden Gate Bridge with Adventure Cat Sailing was not only my absolute favorite way to see it, but it was also my absolute favorite thing we did while on our second visit to San Francisco. 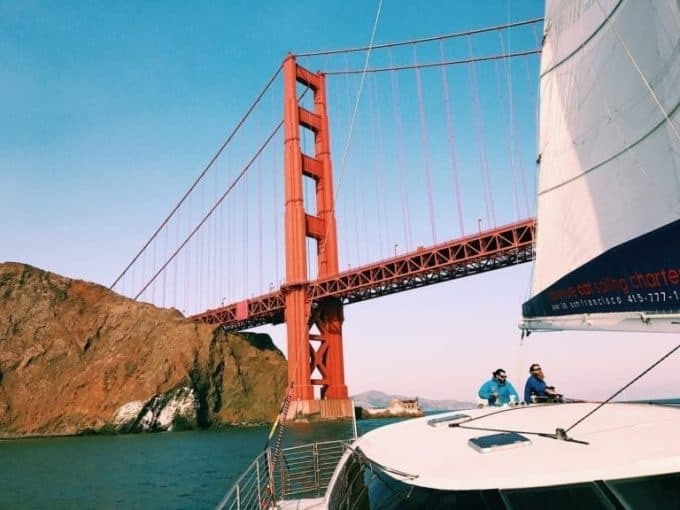 The sailing tour leaves from Pier 39 and is 90-minutes of an adventure experience you won’t get anywhere else. The crew was fun, personable, while still maintaining a level of professionalism you want to see while out on the water. After a while, I needed a little break from the cold and wind, so I headed down below where they had tables and a bar area set up. I ordered a glass of wine and relaxed, just waiting for the moment to sail up to and under the Golden Gate Bridge. When the boat reaches just the perfect spot for pictures, they stop and take your picture for you. 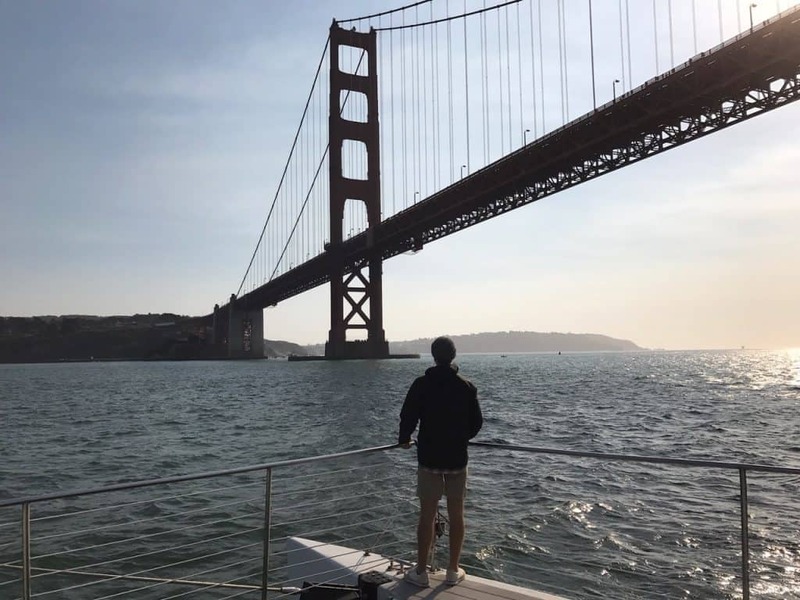 Sailing with my two boys in San Francisco, with this view in the background, is a time in my life I’ll never forget. If you love being out on the water, I recommend booking your tickets for this incredible experience. 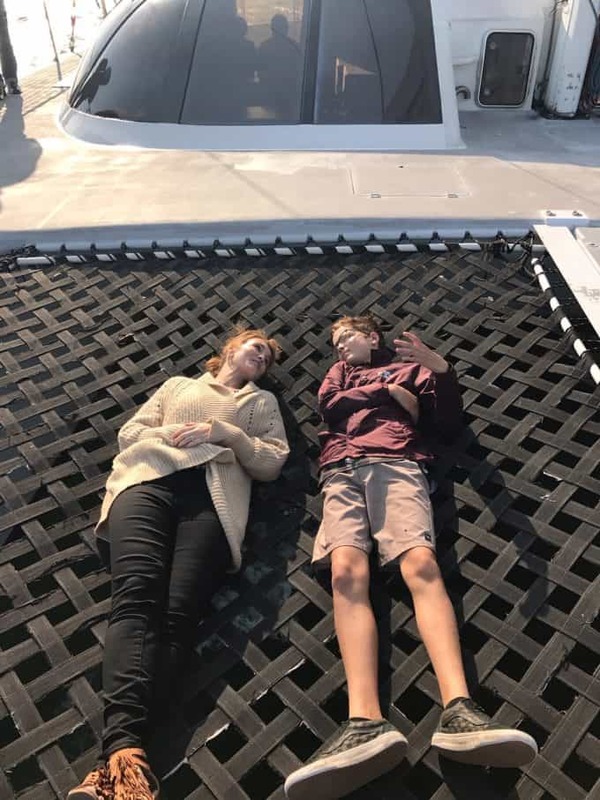 If you’re prone to seasickness and sailing sounds like an absolute nightmare, you can do what Todd did and see the bridge from the Royal Prince Vessel. It’s a smoother and calmer ride out on the water. 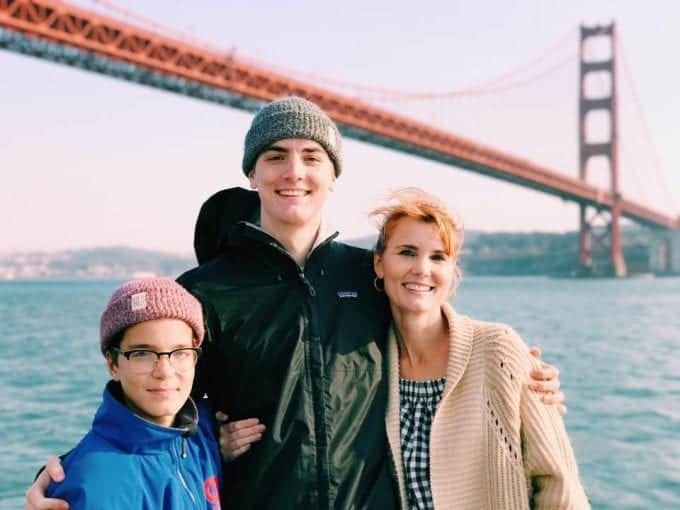 Thankfully, Todd didn’t get sick but instead was able to truly enjoy the view of the bridge, Alcatraz and he even saw the sailboat we were on. 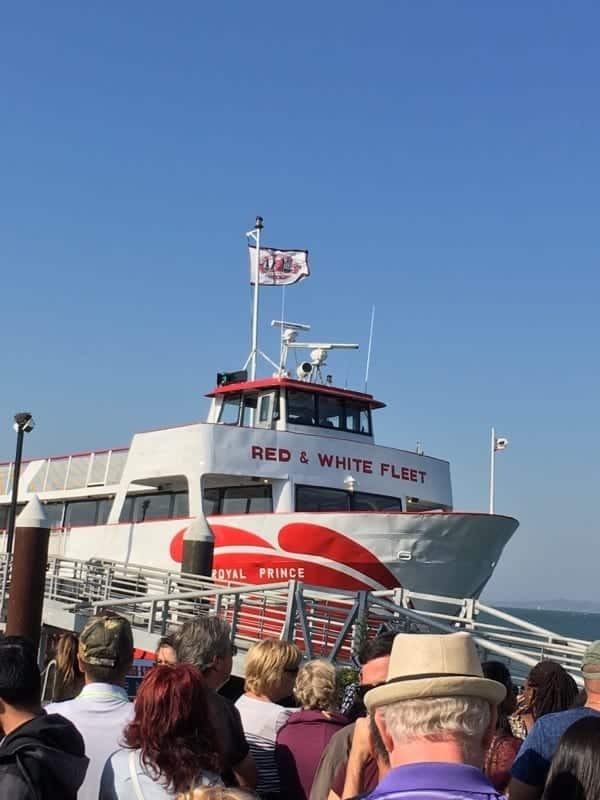 The Royal Prince Vessel also leaves from Pier 39, so it was super convenient for us to go on two separate boats. Off we headed toward the Golden Gate Bridge. It took us about 30 minutes to get out to the bridge and make our way under it for some great views and pictures. I was able to spot a couple of dolphins and some parasailers along the way, as well as spotting my family’s sailboat and a massive cargo ship slipping under the bridge. All in all, an impressive experience. I feel like I’m completely cheating with this last way to see the Golden Gate Bridge because we didn’t actually do this. Instead of biking across the bridge to Sausalito, we took a ferry, which for these non-cyclists, was the way to go. 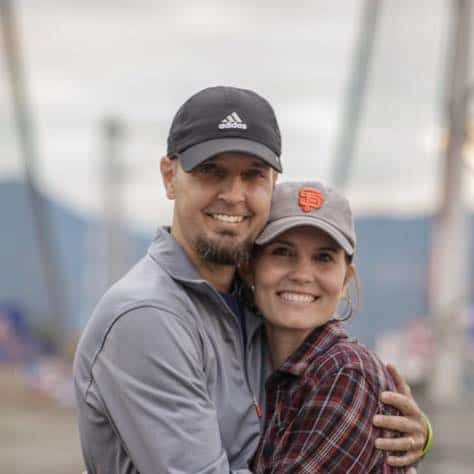 But, if you are a cyclist and are up for an experience of a lifetime, biking sounds like an epic way to experience not only the bridge but both San Francisco and Sausalito. 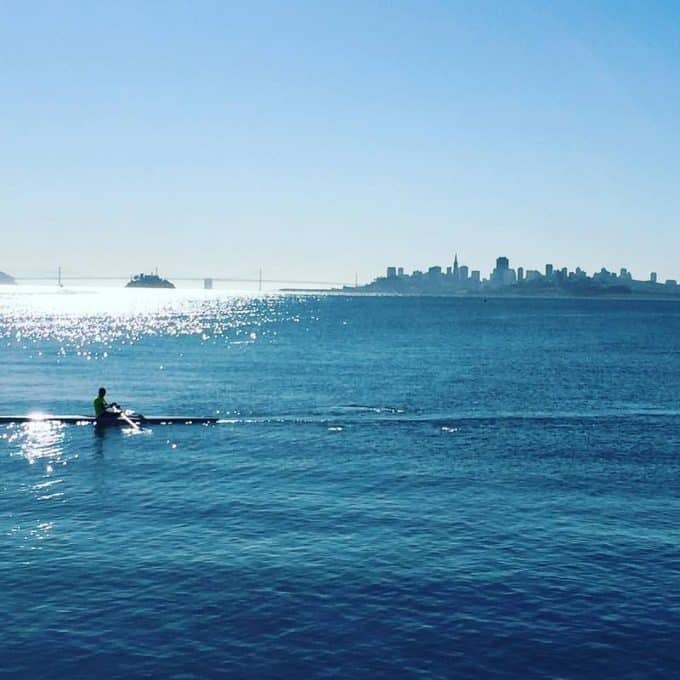 Here’s how to spend a day in Sausalito, with your bike in tow. Bike across the bridge to this quaint and beautiful little town. Park your bike in one of these designated spots. Spend the day shopping, eating and antiquing. Be sure to walk along the water. Look up the crazy real estate prices on Zillow like we did. (Super fun.) At the end of the day, take the ferry back because bikes are allowed on. And there you go, the perfect day in Sausalito that started with a fantastic view and experience with the Golden Gate Bridge. 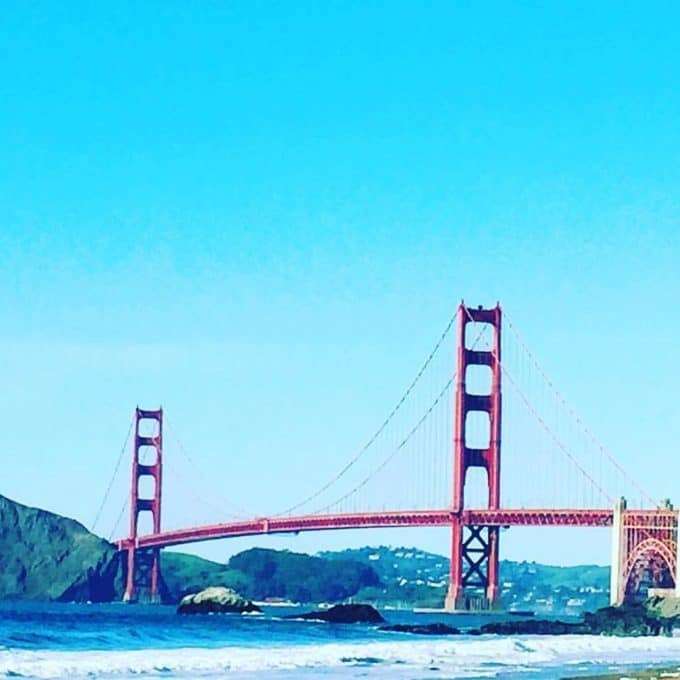 However you decide to get the perfect view of the Golden Gate Bridge, we truly hope your time there is as wonderful as ours was. We’ve flown there and stayed at an Airbnb and we’ve RVd right in the city. Both were amazing experiences we hope to have again someday. 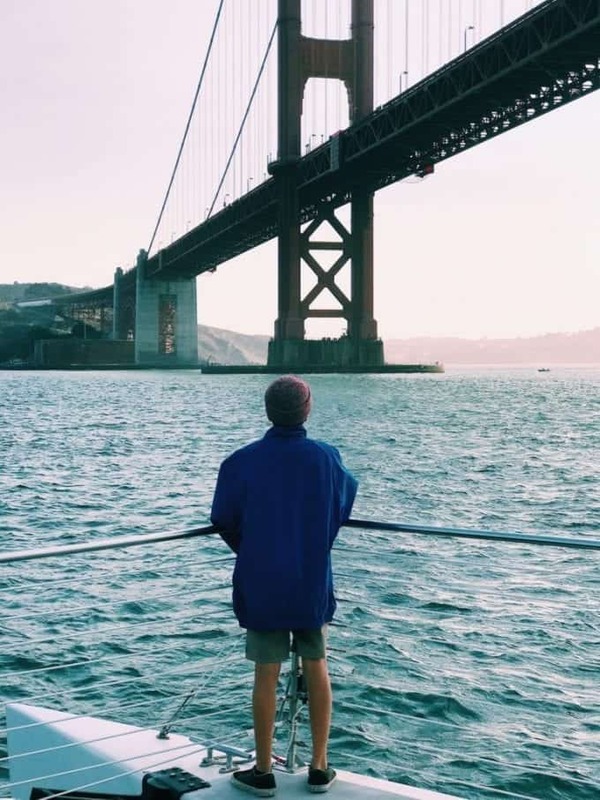 Nice photography spots to capture the golden gate bridge! What gorgeous views! We’ve been to San Francisco twice and the first time we did take one of those tour buses it was pretty cool to go to all the places we did. The next time we did go to that beach (thankfully no naked men, lol) and went out to Alcatraz too. It was much cooler than we expected and almost froze! Would love to go again. Glad you avoided the nakedness 🙂 And yes, every time we visit I end up being so cold! Another spectacular viewpoint is Point Bonita Lighthouse. It is a drive, but absolutely worth it, fog permitting. The Marin Headlands are incredible to visit. I wish I had seen this before my trip to San Fran! I had no idea that sailing under the bridge was an option, I did peak it though while going to Alcatraz! Thanks so much for these tips. We didn’t know either! But so glad we found out about it. I can’t wait to do it again. What a fun article. My wife’s job takes her to San Fransisco a couple times a year. I’m sending her this link so she can check it out. She’d love to sail beneath the bridge! So many wonderful spots to see in SF! Happy to be able to call this place home. 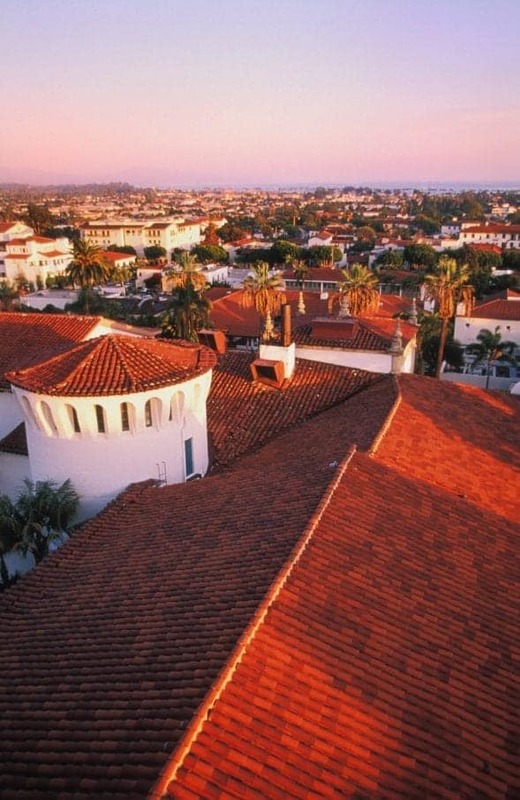 It’s one of our favorite cities to visit! We have visited but only drove and walked across I love all of these other options.